Some people dream of having a white Christmas while for others, the mere thought is a nightmare. The mounds of snow piling up in the driveway and the walkway can be daunting when it becomes a chore to get through every morning just to get to work. That’s where having a Power Smart snow blower comes in handy. We’ll discuss specific models such as the popular (and affordable) Power Smart DB7103-24 and the Power Smart DB7651, but first let’s cover some basics about buying a snow blower. Before snow blowers existed, people had to rely primarily on snow shovels to clear a path down the driveway. This is often very time consuming, not to mention also quite dangerous to your health. Today there are numerous types of equipment from the traditional snow shovel to electric snow shovels and snow blowers (also sometimes referred to as snow throwers) to get the job done. There are several different options to choose from for your specific needs so it might be a good idea to check a few of them out first before deciding on what you’re going to go with. What Do I Need from a Snow Blower? There are a lot of units out there with unique features that can help to make the job a little easier so before you venture out to buy one, first ask yourself some important questions. Should I get a gas-powered or electric snow blower? Do I need a single-stage or a dual-stage? You’re in luck because I have some helpful tips to share with you on how to choose the right snow blower for what you need. These are your more common models and have been around longer. They come in two different stages – which is how the snow is entered into the machine. Single-stage models simply use a steel auger to break up the snow then tosses it through a chute. Two-stage models break up and lift the snow using an auger then sends it to an impeller which blows it through a chute. For clearing paths where there may be ice, a two-stage unit can cut through and remove it along with the snow. 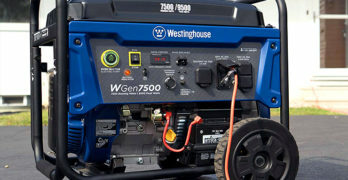 Budget will be a considerable factor when opting for one of these, but if you need something with power it’s worth it. You will also find a greater selection in gas-powered models compared to electric models. Electric snow blowers have their benefits over gas-powered too. If you don’t typically see heavy snowfalls and have a relatively small area (patios, walkways, single-car or short driveways) then this is all you really need. They run much quieter than a gas-powered unit and lighter as well so they’re relatively easy to maneuver and to store. These are friendlier on the budget as well so you may have more room to splurge a little for those extra features that may be worth considering. You know those really brisk chilly mornings when it takes a lot to get you up and going? It’s the same with a gas-run unit. When the temperatures are freezing out, your unit will take a lot more effort and time to get it started using the recoil starter. Most gas-powered models now feature an electric start and it’s worth going for. These make it easy to get the machine up and running with just the push of a button rather than using a pull-cord that you have to constantly pull and pull. These are narrow steel bands that are found on some models on the sides of the augers to cut through hard-packed snow. When you’re trying to plow through that dense snow drift you will notice a significant difference in a model with these than one without as they make it much easier to clear through. Pushing a unit in freezing temperatures can be very uncomfortable, especially with a machine that has a poorly designed handlebar. Some snow throwers are designed with a solid bar and others have two separate handles. Choose the option you feel more comfortable with taking into consideration the height and your height to make pushing it a little easier and get the job done more efficiently. Some models even have built-in hand warmers as an added feature! Snow blowers have come a long way from their humble beginnings. One of the benefits that electric blowers offer is they are smaller and lightweight compared to gas-powered units, making them easy to store. Many gas-powered and electric models feature folding handlebars that fold down towards the engine for more compact storing capability. If you’re going to be transporting the blower in a vehicle, this may be an important factor to keep in mind to ensure it will fit without having to disassemble the whole unit. Some snow blowers offer speed control features that allow you to adjust the speed in forward and reverse. This feature makes it easier to use and more tailored to your needs. With these tips in mind, I’ll introduce you to some snow blowers I found that meet some (if not all) of these components to help steer you in the right direction if you’re new to these machines. Power Smart is a line snow blowers made by Amerisun, Inc. I have featured various models by this manufacturer in the Power Smart snow blower line below for a number of reasons. Most importantly, they deliver great quality, durability, and they’re offered at considerable prices that are actually 30% less than the average snow blowers in their class. Very affordable for a 2-stage snow blower. 208cc LCT 4-Cycle Engine With Push Button Electric Start. Runs on regular gasoline; no need to mix gas & oil. 2 Stage Auger / Impeller System. 4 Forward, 2 Reverse Speeds. Handle mounted crank lets you aim snow discharge on the fly. Adjustable Metal Skid Shoes-Alters scraper height for easy use on varied surfaces. Foldable Ergonomic Handle-Work more comfortably & store easily. View or download the MANUAL for the Power Smart DB7651. This model is a gas-powered Power Smart snow blower that is powered by a 208cc LCT Storm Force OHV engine. It can take on your moderate to heavy snowfall using 12-inch all steel augers with a clearing swath of 24 inches and intake as much as 21 inches of snow. The DB7651 features speed control including four forward speeds and two for reverse. There is a panel conveniently located between the two handles that lets you easily control the drive speed and direction. You can also control the snow chute discharge remotely using a nifty joystick control that is easily within reach to alter the direction the snow is thrown as you see fit. This is very handy as you want to be sure the chute is never directed towards people or animals while you’re operating the unit. It features an electric start so you can get it running right away without the hassle of pulling a cord in the cold climate. You can adjust the height of the scraper with adjustable skid shoes so you can easily clear through snow on multiple surfaces from concrete, dirt, ice or even on gravel. Also, it works well on uneven surfaces so if you have a sloped driveway it’s nothing this snow blower can’t handle! The machine weighs 180 pounds and the dimensions are 36 inches x 28 inches x 29 inches. The handlebars fold down simply by unscrewing the 4 large wing nut bolts. For light snowfalls this is the best choice. Electric snow thrower with robust 13-amp motor. 18″ clearing width and 9″ snow depth in a single pass. Rubber-tipped steel auger throws snow up to 30 feet. 180-degree adjustable chute with over-sized handle. View or download the MANUAL for the Power Smart DB5023. Don’t forget that you’ll need an extension cord. To get the optimal performance from your 13-Amp snow blower we recommend a 14-gauge cord (50-foot) or a 12-gauge (100-foot). Looking for the power to clear through snow without burning a hole in your wallet? This affordable model is a single stage electric Power Smart snow blower powered by a 13-Amp motor to cut through snow up to 9-inches deep and a clearing path of 18-inches wide. For small driveways, patios, and sidewalks it will get the job done. This is actually a really neat snow blower to have for your occasional snowfall with many convenient features. The rubber-tipped auger is safe to use on your deck. The foam covered hand-grip also makes a nice added feature for more comfortable handling in the frigid cold of winter. The 180-degree chute can be easily adjusted with the over-sized handle that is equipped right onto the handlebar and throws snow up to 30 feet away. This is a super lightweight machine, weighing in at just under 40 pounds so hauling it down stairs in the basement during off-season is easy peasy! The dimensions are 22 inches x 19 inches x 20 inches. It is equipped with an over-sized auxiliary handle so you can easily carry it and the handlebars fold down as well for easier transporting or storage. Reliable and affordable. A great balanced snow blower for homeowners. The Power Smart DB7103-24 is an excellent value for most homeowners. It won’t break the bank but it still provides you the power and speed to clear deep snow. If you live in an area like New York, New Jersey or anywhere in the Northeastern part of the USA then you’ll be happy to have this heavy duty snow blower on your side. 208cc LCT 4-cycle (6.5 HP) professional snow engine with electric start. Clears snow up to 24 inches wide and 21 inches deep in one pass. Six Forward and two backward speeds. Snow clearing width of 24″ and a clearing depth of 20-inches. Designed for heavy snowfall. 6-forward and 2-backward speed variations gives you more control. 12″ serrated steel augers pull snow into the blower. Self-propelled makes it easy to move through snow. Push button electric start and manual starter. Handle-mounted trigger controls makes turning, reversing and steering easy. 13″ inflatable tires have deep snow tread for great traction. Assembly required: estimated time 25 minutes. View or download the MANUAL for the Power Smart DB7103-24. This gas-powered Power Smart snow blower also runs on a 208cc LCT 4-cycle engine and clears a path of 24-inches wide and up to 21 inches of snow with one pass. There are four speeds for forward operation and two speeds in reverse. The difference between this model and the Power Smart DB7651 lies in the extras! The DB7103-24 features self-propelled power steering, providing you with easier maneuverability when plowing through heavily-packed snow. There’s an LED headlight to give you better visibility that is built-in on the control panel. It also features a remote chute control so you can adjust the direction of the chute when you’re running it to throw the snow in a safe direction. The interlocking handlebars also feature hand warmers to keep your fingers nice and cozy when operating in the harsh conditions of winter (but you should still wear gloves to protect your hands). This machine also weighs about 180 pounds but it is a little bigger than the DB7651 model with dimensions of 41.7 inches x 54.7 inches x 26.3 inches. Ideal for larger yards thanks to its 26″ clearing width. **The features for this model are the exact same as the previous model (Power Smart DB7103-24), the only difference is Power Smart DB7103-26 has a 26″ snow clearing width. View or download the MANUAL for the Power Smart DB7103-26. When you’re needing something that can efficiently clear a slightly larger area, such as a multi-car driveway, this Power Smart snow blower is a step up in gas-powered models. The 208cc two-stage LCT 4-cycle engine gives you the power you need to cut through up to 21 inches of deep snow for a clearing path of 26 inches within a reasonable price for a machine this size. This unit comes with many extra features that ensure ease-of-use and comfortable operation. Electric start makes it easy to get it started or use the recoil per your preference. Self-propelled steering make it easier to push through and it features multiple speed controls including 6 forward and two reverse speeds. It also features a built-in LED headlight in a versatile control panel with a remote chute control to adjust the 180-degree chute. Surprisingly for a machine this size, it’s not as cumbersome as other large models. At 184 pounds it weighs just a tad more than the previously mentioned gas-powered units with dimensions of 41.7 inches x 54.7 inches x 28.7 inches. Unfortunately, this model is only average. Upgraded version for Power Smart DB7659 24-Inch Two Stage Snow Thrower. 24″ clearing width. 16″ intake height. 4-Way joystick control allows you to adjust direction and height of snow discharge. Traction tires provide good traction in slippery, slushy snowy and icy conditions. Steel construction means it can take a beating — and it will! The Power Smart support team has been completely revamped for the 2014 upcoming season. We recognized the shortcomings of last year. We have added staff, improved the quality, improved the quality control, expanded our service network, and are committed to responding to any customer issue within 24 hours. The Power Smart product is a full featured product line at a great value. We have dramatically improved the Chicago based team to deliver the support needed. If you ever have an issue with a Power Smart product, do not hesitate to contact us at support@amerisuninc.com or 800-791-9458. All machines will require some maintenance to help extend the life of the unit. Always be sure to turn off your snow blower before trying to perform any maintenance on it and NEVER touch any rotating parts before the machine has completely stopped. Don’t do it! Always check the tire pressure before operating your unit. You can use a small air compressor to fill tires. Just be sure not to over inflate the tires. Check your unit’s requirements on the recommended range the air pressure should be for the size of the tires that your snow thrower is equipped with. Always inspect the machine for damage before operating because you certainly don’t want to send pieces flying when you start it up! Be sure the nuts and screws are all securely tightened prior to starting and at frequent intervals. Replace the shear pins as needed. These are the pins that attach the auger shaft to the auger blades. They’re designed to break under impact or a high load, such as a clog or jam to the augers, as a safety measure to protect the auger drive system from becoming damaged. Your Power Smart snow blower should come with extra pins for this very reason, but you can also contact customer service for additional pins if needed. During off-seasons, you will need to properly store gas-powered snow blowers to ensure it will start up again when you need it next winter. Drain all the fuel out of the engine or be sure to add a stabilizer and run it a few minutes to keep the fuel from going bad. You’ll also need to remove spark plugs and oil them to prevent rust and corrosion. Be sure to check the warranty of your Power Smart snow blower and always follow the maintenance and safety requirements as per the manual for the model you have. Failure to comply with the instructions stated in the manual could not only cause possible injury, but it may result in a void in the warranty. Have you read and followed all setup and operation procedures for the engine as outlined in the ENGINE manual? Has the engine been filled with oil to the proper level? Are all snow thrower components properly attached and assembled? Are there any broken or damaged parts? Are the auger, drive and speed controls cables routed properly so that are not kinked and controls operate smoothly? Are the auger, drive and speed controls cables adjusted correctly? Are the tires inflated to the proper pressure? NOTE: Read your manual thoroughly before using your snow blower. Far too many customers make assumptions or use their snow blower incorrectly, then go online and complain that the snow thrower is defective. Unfortunately, customers often damage their product unknowingly. Read the manual and follow the instructions step by step. Do not change speed positions while the drive is engaged. Disengage the drive control handle BEFORE changing speeds or directions. If the snow discharge chute or auger housing becomes clogged STOP the engine, and make sure that all rotating parts have come to a complete stop. Remove the spark plug cap from the spark plug. Use the supplied snow clean out tool to clear the obstruction. After unclogging, wipe the tool clean, and place it in the holder on top of the auger housing. After each snow removal session, run the Snow Thrower for a few minutes to prevent the collector/impeller from freezing. Stop the engine, wait for all revolving parts to stop completely, and wipe residual ice and snow off the unit. Rotate the chute rotation handle several times to remove any excess snow. WARNING! The auger and impeller rotate at fast speeds which can cause harm or even amputation to a person’s body parts. Even if you do not see the auger or impeller rotating, it may start at any time if the engine is running.